Where Does Your Money Go? More than 100 world, national, and regional premieres have debuted at the Huntington. Poetry Out Loud is a national recitation contest that celebrates the power of the spoken word and a mastery of public speaking skills while cultivating self-confidence and an appreciation of students’ literary heritage as they take poetry from the page to the stage. Poetry Out Loud has inspired hundreds of thousands of high school students to discover and appreciate both classic and contemporary poetry. **All contests at all levels are free and open to the public. If you have any questions, please email Poetryoutloud@huntingtontheatre.org. 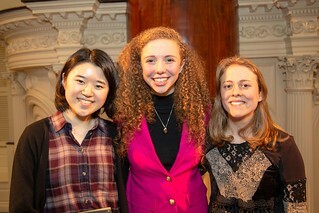 CONGRATULATIONS TO MASSACHUSETTS 2019 POETRY OUT LOUD CHAMPION ROSE HANSEN OF NORWELL HIGH SCHOOL! Why participate in Massachusetts Poetry Out Loud? For more information on Poetry Out Loud, visit the official website at poetryoutloud.org. For information about the Massachusetts competition, please contact Meg O'Brien, Interim Co-Director of Education, at 617 273 1558 or email poetryoutloud@huntingtontheatre.org. Presented by the National Endowment for the Arts and the Poetry Foundation, in partnership with the Mass Cultural Council and the Huntington Theatre Company. © 2019 Huntington Theatre Company. All rights reserved | Trouble viewing this site? Please download Mozilla Firefox or Google Chrome.